HIGHLY pathogenic avian influenza continues to wipe out penguins at the Halifax Island beach near Lüderitz. The Lüderitz Maritime Research Group estimated on its Facebook page that more than 500 penguins have died since the first bird flu outbreak towards the end of last year. “Unfortunately, there is another confirmation that the mortality is continuing unabated. As of today, 345 penguin carcasses, excluding chicks, were recovered from the island and nearby beaches… the real toll is by now probably in excess of 500 birds, mostly breeding adults,” a recent post on the group’s Facebook page reads. According to the group, they have noticed that most of the affected penguins are clustered around “colony 2” on the south side of the island, and in particular near a muddy patch adjoining this colony. “As the virus H5N8 can survive for weeks in a wet environment, we suspect that this mud patch might be a factor in the continuing mortalities as it is crossed daily by adult penguins returning from the sea,” the Facebook post further reads. The group said the fisheries ministry’s officials had recently spread buckets of salt over the mud patch in an attempt to lower the rate of infection. 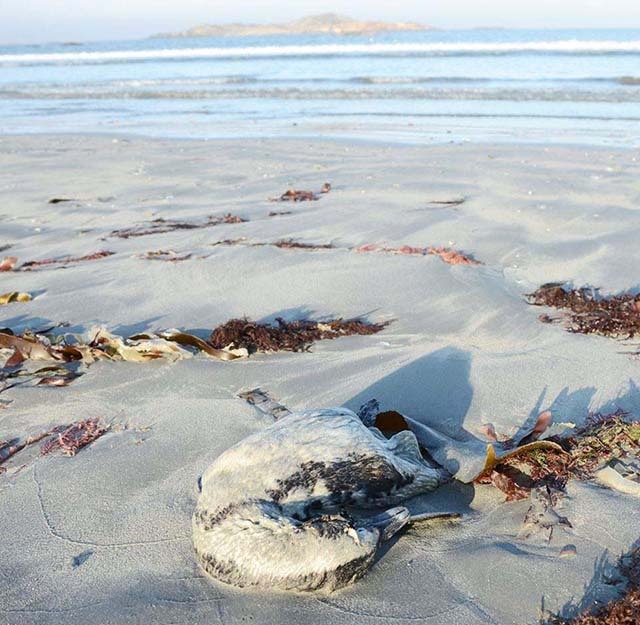 Dr Jean-Paul Roux, a member of the research group, who spoke to The Namibian yesterday, said the damage in terms of the dying penguins might be more serious because it is not known whether the outbreak had spread to the three adjacent Possession, Ichaboe and Mercury islands. More than 32,500 free-range chickens on a farm in Changhua County have been culled after the farm was confirmed to be infected with the highly pathogenic H5N2 avian influenza virus, an official from the county’s Animal Disease Control Center (ADCC) said Monday. ADCC Director Tung Meng-chih (董孟治) said the birds were exterminated and disinfectant work carried out at the farm after the test results came back a day earlier. Suspicion of an avian influenza outbreak arose after 340 chickens on the farm died within a relatively short space of time. In wake of the latest cull, Tung reminded farmers that if they discover their poultry showing symptoms such as swollen faces, bleeding from the eyes and nostrils, and other signs of disease to proactively contact their local animal disease control centers. According to statistics provided by the Bureau of Animal and Plant Health Inspection and Quarantine (BAPHIQ), four other poultry farms across the country have been affected by the H5N2 avian influenza virus so far this year, including two chicken farms and one duck farm in Yunlin County, and one duck farm in Pingtung County. BAPHIQ statistics also show that a total of 93 poultry farms were hit by H5N2 in 2018. H5N2, a subtype of the influenza A virus, is known to infect a wide variety of birds, including chickens, ducks, turkeys and ostriches. THE deaths of penguins at the Halifax Island beach some 10 kilometres outside Lüderitz near Diaz Point, about 100 metres off the mainland, are suspected to be linked to bird flu. The ministry of fisheries’ spokesperson, De Wet Siluka yesterday confirmed that symptoms of bird flu were detected from the live and rehabilitated penguins’ observations, and it is suspected it might be the cause of the penguins’ deaths. The recent inspection, conducted on 27 January, found similar symptoms in one of the swift tern birds on the same island, he added. But, Siluka said, central veterinary laboratory results expected soon were still needed to determine the exact cause of the seabirds’ mortalities. The deaths of the penguins were discovered late last month, and about 250 mostly adult birds have been reported dead. He said the ministry is committed to visiting the island on a regular basis, despite rough weather conditions, to collect dead penguins’ bodies, and burn them to avoid the further spread of the suspected cause of death. “We are also collecting and rehabilitating the infected penguins at our intensive care facilities,” he continued. Siluka said the biggest worry is that penguins are already endangered species. “Besides good population growth recorded on this island, here comes another catastrophe to the penguins’ population growth,” he stated. Halifax Island, according to the ministry’s spokesperson, is the third most important breeding site for African penguins, and is home to about 2 500 penguins that contribute to the entire Namibian population of about 26 000 penguins. Other seabirds breeding on the island include crowned cormorants, swift terns and Hartlaub’s gulls. Penguins are part of a food web, and basically feeding regimes of other seabirds as well, and the ministry was thus working around the clock to establish the cause of death. An H5N1 bird flu outbreak has hit Vietnam’s southern Long An province, killing thousands of chicken and ducks in the Long Son commune, Can Duoc district. According to the provincial Department of Agriculture and Rural Development, the H5N1 virus hit the farms owned by two families in the commune. One of the families lost about 3,600 ducks. Local government agencies had to cull sick birds, as well as isolate and disinfect areas hit by the disease, tighten control of fowl transport in the affected areas and intensify bird flu vaccination. Vietnam, however, has no report of new human cases of H5N1 infection since 2014, according to the country’s Ministry of Agriculture and Rural Development. Bird flu scare continues to persist in Bihar as 400 chickens were found dead at a poultry farm at a village in Bikram block in Patna district in the last 24 hours. More than 2,000 birds, including chicken and ducks have been culled in a village at Munger after tests confirmed H5N1 virus. The government warned about both foot-and-mouth disease and bird flu … There are 24 foot and mouth outbreaks in 6 provinces and cities. Nhan Dan newspaper reported that on January 3, SDAH Kon Tum province confirmed, currently in Kon Tum province, there are three districts that have foot and mouth disease (FMD) in pigs and avian influenza A / H5N6 are Dak Ha district, Dak To district and Ngoc Hoi district with thousands of birds and hundreds of infected pigs were destroyed. Previously, from December 28, 2016 to January 2, 2016, the local veterinary service detected FMD outbreaks in pigs in two households in hamlet 1B, Dak La commune, Dak Ha district and six households. Other livestock belonging to Block 5, Block 6, Block 8, City block 10 Dak To town, Dak To district. In Ngoc Hoi district, there are more than two thousand birds of a livestock household in Ngoc Hai village, Bo Y commune infected with influenza A / H5N6 virus. Mr. Le Duc Hung, Head of Dak To District Animal Husbandry and Veterinary Station, confirmed that FMD has appeared 4/11 city blocks. In addition to the weather factor, the main cause of the occurrence of FMD outbreaks in the province is mainly due to vaccination. Currently, due to small-scale animal husbandry, most pig farmers are difficult households, pigs of these households are only vaccinated against cholera according to the State’s support program, and diseases most of them are not vaccinated, so the risk of outbreaks is very high. Also in Dak To district, through inspection at the Centralized Slaughtering Center of the district, the Animal Husbandry and Veterinary Station of this district discovered eight porkers of the Purchasing Center waiting for slaughtering infected with FMD. Although these pigs have been recorded and destroyed, people in Dak To town are worried that this is one of the causes of FMD outbreaks in the area because at present, the Cattle Slaughter Center of the district Dak To is a place to supply pork for most people in the town and surrounding communes. A poultry farm in Wicomico County had an inconclusive test for avian influenza, leading to 40,000 chickens being put down at a farm in Powellville. The farm was experiencing “higher than normal mortality” and was submitted to the Maryland Department of Agriculture laboratory for a disease screening, according to a release from Delmarva Poultry Industry, Inc. Disease screenings include testing for bird flu. Bird flu is a viral disease that affects multiple species throughout the world, according the Maryland Department of Agriculture. The risk of infecting humans is very low and is often limited only to the people in direct contact with the birds, although occasionally other people have been affected. In a precautionary measure after a number of blood samples of chicken found positive with bird flu virus in at least three villages under Brahamagiri block, the district administration today ordered for bird culling and ban on poultry sell in the area. Informing on the steps, Puri Collector Jyoti Prakash Das said a decision has been taken to start bird culling within the radius of 1 kilometre from the affected area. The culling will start from tomorrow, he added. Apart from bird culling, the selling of poultry products within a radius of 10 kilometres from the affected areas has been banned along with a stoppage in supply of eggs for Mid-Day Meals provided in schools. Notably, bird flu fear loomed large in Bhrahmagiri block in past three days after over 20,000 hens died in a mysterious disease. While blood samples of the birds were sent to the National Institute of High Security Animal Diseases (NIHSAD) in Bhopal, a number of those were taken from Patharganj, Budhibar and Masasahi villages were found positive with H5N1 viruses.